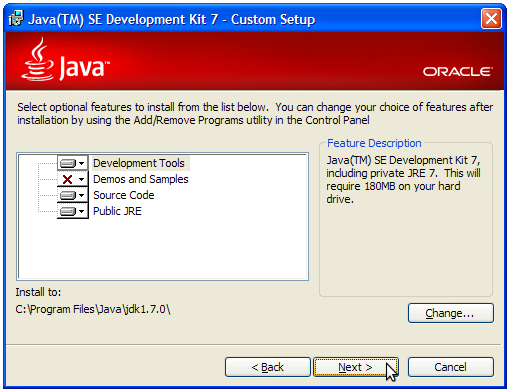 You will need to install, at most, two pieces of software: The Java Development Kit (JDK) and the jGRASP editor. The directions differ based on your operating system. 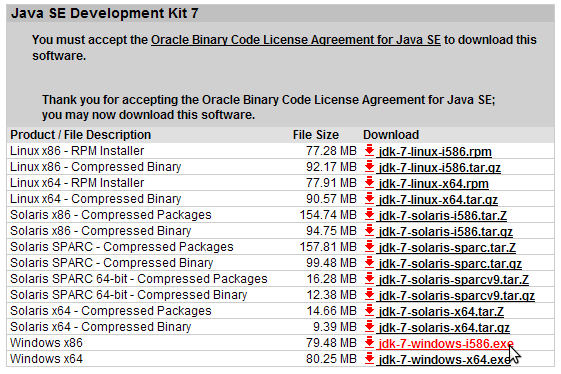 Go to the following Oracle Java download page. Once you have finished downloading this file to your Desktop, you must install JDK on your system. Do this by double-clicking the JDK installer file you saved on the Desktop. You can just repeatedly click Next to choose all the default options during installation. From the jGRASP web site link above, click the button at top-right labeled Download jGRASP. You will be taken to a download page with some survey information. You can just scroll down and skip the survey. Underneath the survey is a set of buttons. Click the jGRASP exe to download a file named jgrasp188_24.exe. Save the file to your Desktop or another convenient location. NOTE: Some people who use Windows 7 or Windows Vista may need to choose to "Download Jar File" rather than "Download Windows App." 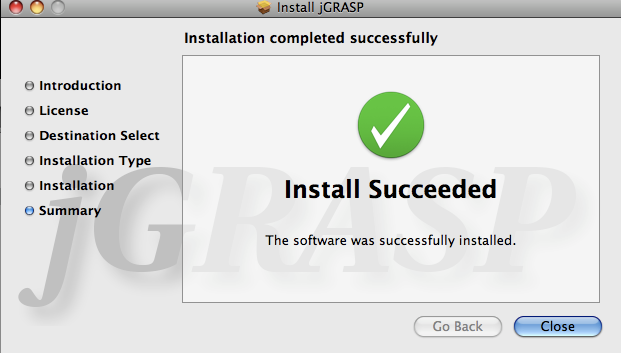 Once you have finished downloading this file to your Desktop, you must install jGRASP on your system. Do this by double-clicking the jGRASP installer file you saved on the Desktop. Once you are done installing jGRASP, you should now have icons on your Desktop and in your Start Menu for running jGRASP. We have had particular problems come up for students using the 64-bit edition of Windows. This section discusses those issues and how to work around them. Click the Start button, then choose Control Panel. Click System and Maintenance, then System. 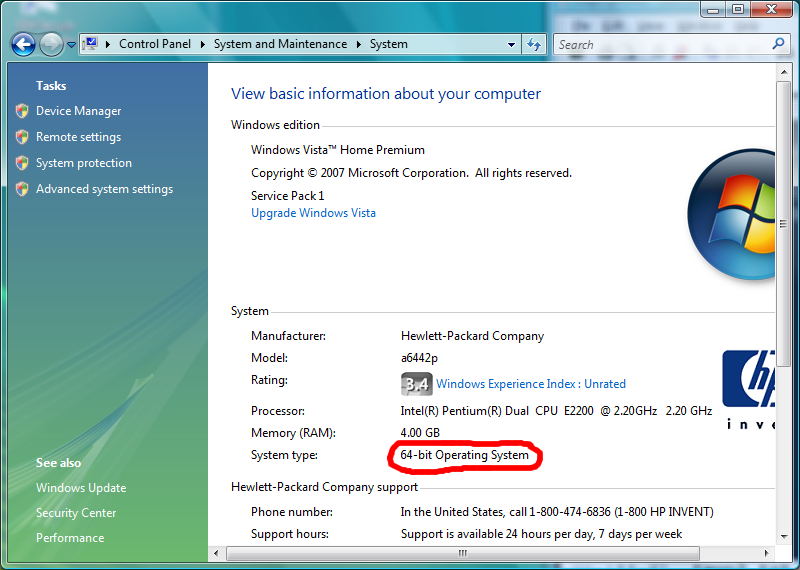 Now you should be seeing "Basic information about your system", including whether it is 64-bit. jGRASP wedge2 error: command "javac" not found. or on the current PATH to use this function. The J2SE SDK is available from java.sun.com. "I was able to get jGRASP to be used. At first I was expecting the program not to work correctly and I tried different things first. I installed the JDK 64 bit version first which caused the error wedge2 error. I then decided to use compatibility mode to XP SP 2, which that cause a whole entire new error. Then I installed the traditional 32 bit JDK and turned off compatibility and it somehow worked." So, in other words, installing/using the standard 32-bit JDK rather than the 64-bit one may be the best choice at this time. Macs with the OS X operating system will have the Java compiler available automatically or will download and install it automatically, so you should be able to skip this step. But many Macs have an out-of-date version of JDK, so you may need to install the latest Mac version of JDK. Some newer Macs (purchased within the last 3 years or so) may already have this software, but older ones do not. If you have a fairly new Mac, try to skip to Step 2 and see if jGRASP works, and if not, come back to this step. You might also want to run your Mac's built-in Software Update feature to see if it updates your Java for you. If your Mac doesn't have Java installed already (or has an obsolete version installed), you can go to the web page below to download it. Once you've downloaded the file, double-click it on your desktop to install it. Find jdk-7u25-macosx-x64.dmg on this page. Be sure to "Accept License Agreement." 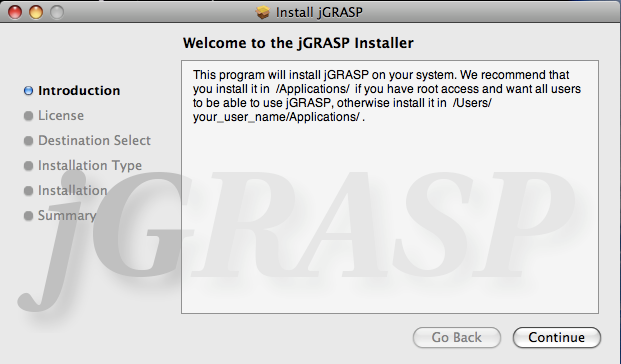 Once you have extracted jGRASP application PKG file from the archive, double-click it to install jGRASP. At each screen, you can choose the default options and click "Continue" or "Install" to move forward. If you've done it correctly, you will see an "Install Succeeded" message and a green checkbox. Once jGRASP is installed, you can run it from your Applications folder, Dock, or by typing "jgrasp" into your Spotlight search at the top-right of your screen. If you see this message, you should update your Mac to Java v1.6 by running the Mac's built-in Software Update tool. 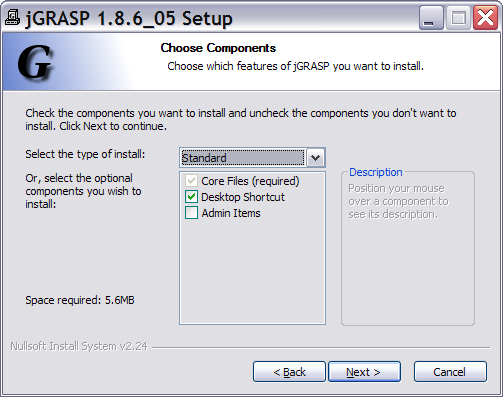 Then re-run jGRASP and click Settings, jGRASP Startup Settings, and set your Java version to 1.6.0. Click "Ok" and close the error message window. Then re-open jGRASP and the problem may go away. Some students are reporting that characters are missing from their println messages on the console. We don't know what is causing this. If you have this bug, let us know what kind of Mac you have (Intel or PPC? What OS X version? etc.) and we'll try to figure it out. If you continue having problems with jGRASP, you may want to try another Java editor named DrJava. It's tougher to give an installation guide for Linux because of the large variety of different distributions and architectures. Here is a rough guide that will work for many distributions such as Ubuntu. (If you use a Linux distribution that supports RPM packages such as Fedora Core, you may wish to use the RPM file). You should close your terminal and open a new one for the PATH changes to take effect. If you are unable to get the jGRASP debugger working in Linux, try downloading the following jgrasp BASH script file and putting it in the jgrasp/bin folder. Give it execute permissions (chmod +x) and then use it to run jGRASP. 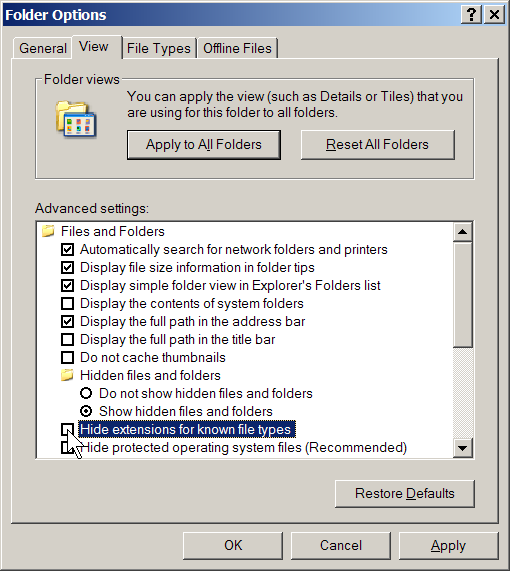 By default, Windows does not show extensions of certain types of files. 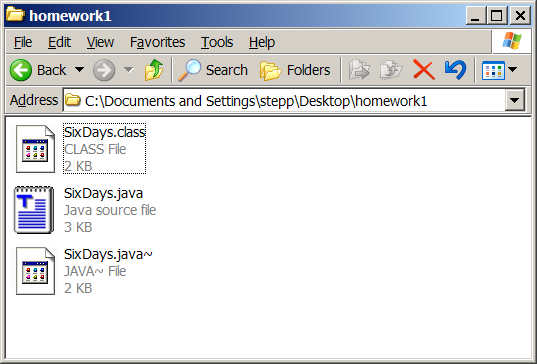 This can lead to confusion because you may not know which file is your .java program and which is your .class compiled file. 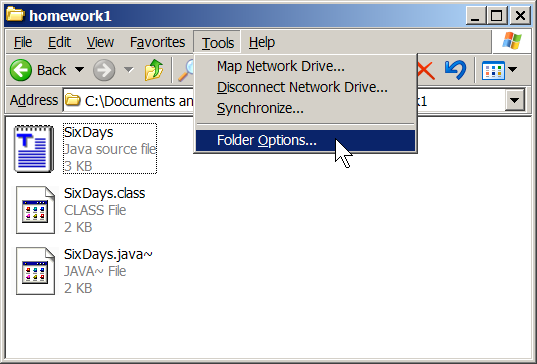 A Folder Options window will appear. Click the tab labeled View, then find the checkbox labeled Hide extensions for known file types. Uncheck it. Press OK.
Now all files should show their extensions in Windows. Some users who have international (Chinese, Korean, etc.) versions of Windows cannot properly see the compiler errors in jGRASP. To fix this problem, follow these steps in jGRASP. 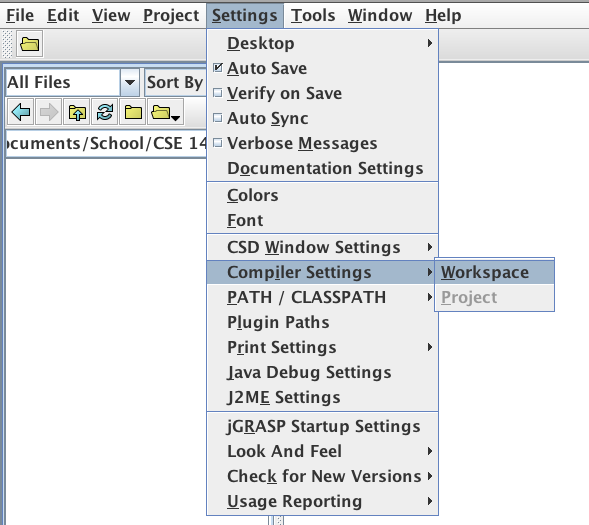 Click "Settings" -> "Compiler Settings" -> "Workspace". In the settings box that pops up, click the "Flags / Args" tab (in the lower row of tabs). 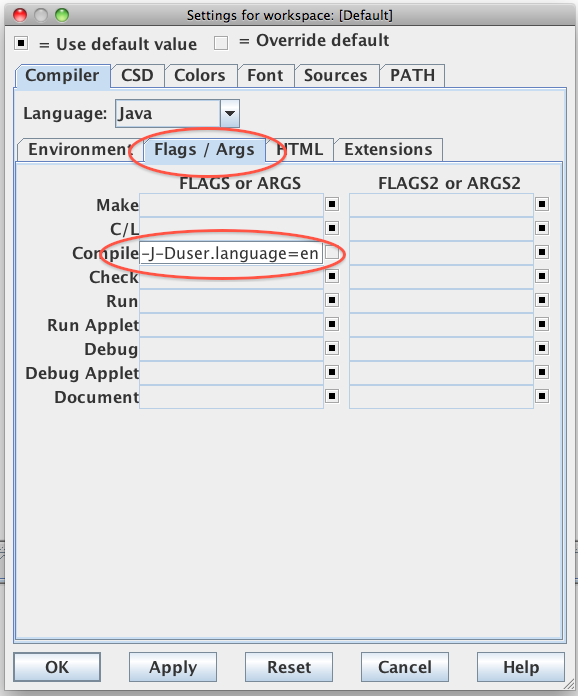 Then, click the black "button" under "FLAGS or ARGS" and next to "Compile". In the text box that becomes available type in "-J-Duser.language=en" (without the quotes) and click "OK". 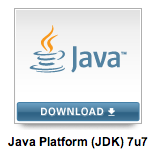 Try installing JDK v1.6 instead of 1.7.